Iromori’s “Kingyo”—a fabric that blends vibrant golds and oranges in a brilliant goldfish like gradiation. One of the best parts of this fabric is its ever changing pattern, which gives way to entirely unique pieces. The bottom left of the photo is a blouse and the right is a binder made with this wonderful “Kingyo” fabric. iromori’s “Mizutama”—a charming fabric of differing blue polka dots. The blue polka dot pattern of this Mizutama fabric gives off a refreshing and clean summery vibe. Sitting on top of the fabric is a small accessory pouch, made using the Japanese dying technique, Yuzen. 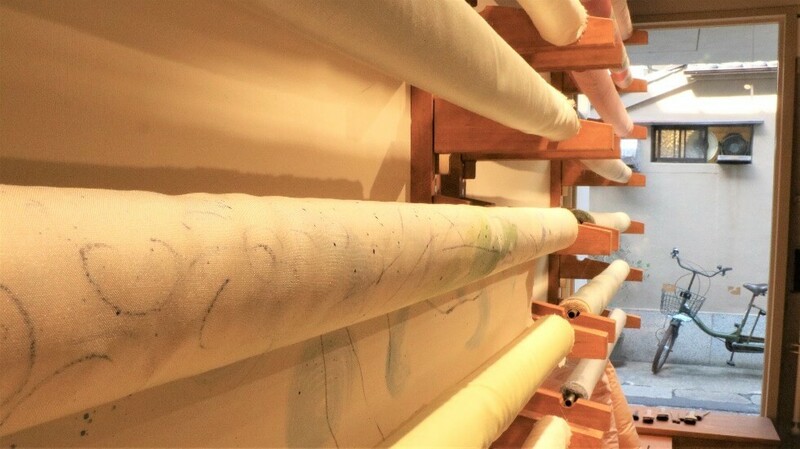 iromori’s “Iromudji”—a simple, designless fabric with a refined, warm yellowish-green hue. Although this is a completely hand-made fabric, hardly any unevenness can be found in its coloration. As the fabric is almost entirely colorless, it’s easily paired with anything and can be used on a range of items, including clothes and accessories. A range of Yuzen fabrics line the wall, so if you find a design that catches your eye, just yell out to a staff member. 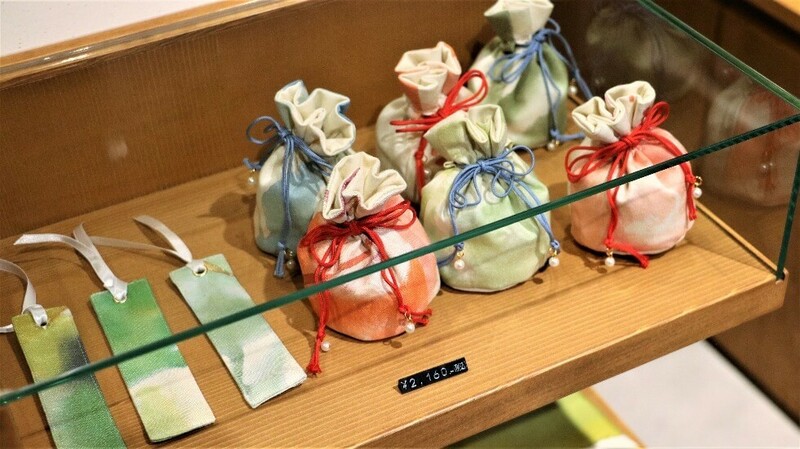 iromori also stocks a range of Yuzen items great for souvenirs, including bookmarks and scented scathe pouches. This was my first time getting to see a dyer make something in the traditional Yuzen technique in person and I was totally blown away. At iromori there are also workshops where you can give making a Yuzen design yourself a shot, I highly recommend. I also recommend iromori to those looking for something special for a loved one, as they sell accessories and the like with beautiful Yuzen patterns. Iromori is quite easy to get to and the staff will kindly explain anything you may want to know.